Reinventing, we have transformed a popular choice of effect into an adorable product. 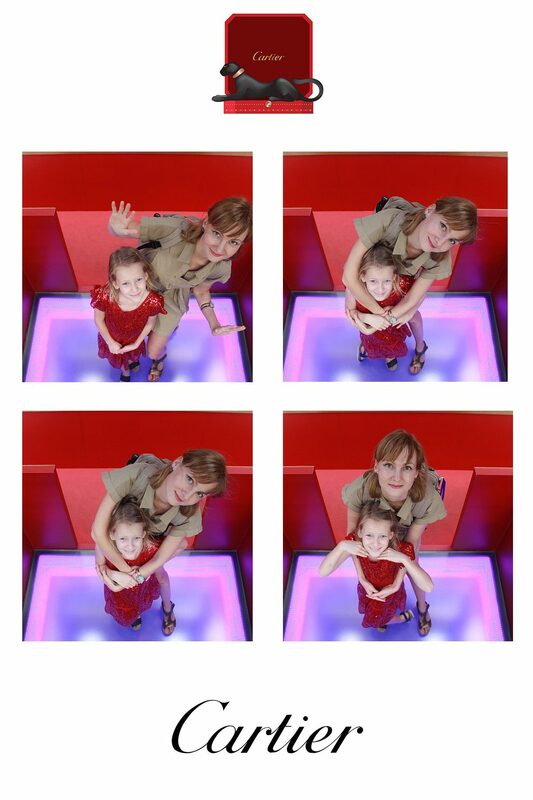 Kaleidoscope Booth is a new product that is only provided in Singapore Cheese Effects. The advantage of the Kaleidoscope design, there will be more opportunity to showcase brands, products and also your great dance move. Audio (mp3) can be insert into the video for full experience. The system can be incorporated with many products due to the structure of the video. How kaleidoscope video booth works? Guests step into the booth and pose in front of the camera. See and adjust themselves with our live preview monitor. Guests can preview and send their Kaleidoscope video immediately using our secondary touchscreen monitor. Print can be in Kaleidoscope format! When opt for the print function, the photo can be printed in this unique kaleidoscope format. Alternative, you may also choose to use back the classic 3:2 landscape style. Please note that the guests will need to pose during the photo-taking, this will get them ready and looking good. We do not extract a frame from the kaleidoscope video for printing. Project – A giant Ferris Wheel inbuilt with our Kaleidoscope boomerang and print machine! The Ferris wheel activation lasted for 2 months was one of the highlight for the opening of Cartier outlet at ION mall. Some of the unique feature of this kaleidoscope project is the overhead camera capture, 10 meter distance away email sharing station (to separate photo-taking & email sharing crowd) and non-stop continuous printing service. The team were given 3 weeks of preparation to overcome the above challenges and worked closely with the Ferris Wheel’s builder for our booth system installation. The Ferris Wheel also comes with cloud live paper tracking so we can ensure sufficient paper prints throughout the activation. In view of the outdoor placement, electronic devices went through weatherproofing by us to prevent system damage during the raining season. Check out behind the scene videos below! Although kaleidoscope effects is a straight forward and achievable effects by using external editing program. Its a type of effect that requires a lot of work to be done by the program, often taking too long to produce a single video (manipulating high resolution videos). At Cheese Effects, our booth start processing the videos during capturing instead of after capturing. This way we can send your kaleidoscope video in seconds and spend more time taking more videos. Participants of the Cartier Ferris Wheel will be able to receive the print out of the photo immediately. At the same time, they are also able to send the above kaleidoscope boomerang video and digital photos via email. Cheese Effects is able to monitor the daily output and crowd to assist client with manpower allocation. Kaleidoscope aka the magic tube effect has been around for many of our childhood. Cheese Effects provides this popular, addictive effect into a high quality brand-able video-booth. The adorable multiply effect and the special circular shaped required may offers many new ways to showcase your product. Such as snow globe, bottle cap and watch face. 1Unlimited print are attune to each person in the photo per print. Additional 1 x print will categorized as add-on service. *Noted we do not print on both side of the paper. 6″ x 2″ print is folded in half to achieve double sided prints. How long is the video duration for Kaleidoscope? Kaleidoscope is easy! We uses DSLR (high quality) to capture and unique customized branding of your event logo is added onto every Kaleidoscope. How long does it takes to generate the Kaleidoscope video? It takes only a few seconds to generate the video. The system is so efficient we can have non-stop guests playing the booth. Ideally, 2.5m x 2.0m is great for comfort of your guests.